« RIM under New CEO Thorsten Heins: So crazy, it might just fail? My only theory as to why this was published is that Heins recurring insistence that a new head of marketing must be hired irked the current marketing people, but that is pure conjecture on my part. Nobody watching the company in the past 5 years would accuse it of “innovating too much”. When I met with then-CEO Lazaridis a few years ago, he brushed off touchscreens as a fad and insisted that RIM would stick to its roots. 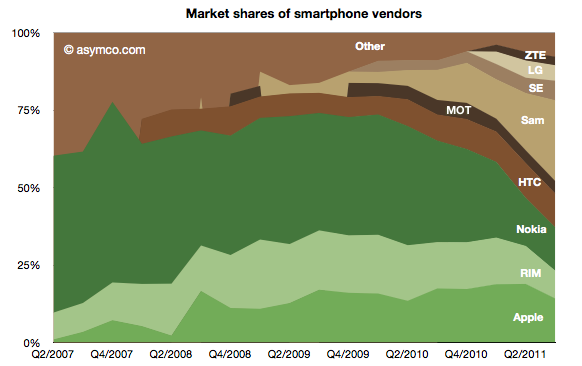 Only after iOS and Android took off with their respective markets did BlackBerry follow suit. The PlayBook was a bomb, and TabletPCReview writes that RIM’s marketing department, so bereft of leadership now, has been driving it. RIM has a great history and pushed the mobile industry forward in a lot of ways, but the past few years the leadership has shown a blissful ignorance of the evolving industry coupled with unwarranted optimism for BlackBerry’s future. Whatever innovative ideas Heins has, he’s already gotten off on the wrong foot when it comes to convincing many that the platform has a serious future.